The purpose of the Skaggs Scholars Program is to to stimulate collaborative research between Colorado pharmacy faculty members and faculty members at one or more of the six other Skaggs institutions: University of Arizona College of Pharmacy, the University of California San Diego Skaggs School of Pharmacy and Pharmaceutical Sciences, University of Colorado Skaggs School of Pharmacy and Pharmaceutical Sciences, Idaho State University College of Pharmacy, the University of Montana Skaggs School of Pharmacy, the Scripps Research Institute | The Skaggs Institute for Chemical Biology, and the University of Utah College of Pharmacy. 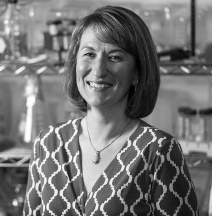 Dr. Beamer's research title is Aryl hydrocarbon receptor activation by polycyclic aromatic hydrocarbons induces and exacerbates inflammatory skin diseases in mice. Atopic dermatitis (AD) and psoriasis are chronic inflammatory skin diseases and a growing health concern because of their high prevalence in the general population and associated low quality of life. The rapid 2-3- fold increase in incidence of these skin diseases worldwide, mainly in the industrialized countries, cannot be attributed to genetics alone, suggesting that environmental pollutants might contribute to the onset and progression of disease. AD and psoriasis are characterized by defects in the skin’s barrier, as well as uncontrollable immune responses. However, the precise cellular and molecular events that trigger abnormal immune response and barrier defects in response to environmental pollutants remain unclear. The aryl hydrocarbon receptor (AhR) is a sensor which is activated in response to occupational or topical exposure to ubiquitous organic environmental pollutants such as those found in cigarette smoke and diesel exhaust. Therefore, understanding how these pollutants change the activity of the AhR and contribute to the development and worsening of skin inflammatory diseases may lead to the development of new effective treatment strategies and serve as a tool for hazard/risk assessment of pollution exposure on skin. In this proposal, we will study the role of AhR simulating environmental or occupational exposure to pollutant benzo[a]pyrene (found in cigarette smoke, diesel exhaust and wood burning etc) in mouse skin with sufficient or deficient AhR activity to answer these questions using an array of cutting edge experimental approaches like metabolomics. Beamer will study the role of AhR simulating environmental or occupational exposure to pollutant benzo[a]pyrene (found in cigarette smoke, diesel exhaust and wood burning etc) in mouse skin with sufficient or deficient AhR activity to answer these questions using an array of cutting edge experimental approaches like metabolomics. The purpose of the Academic Research Enhancement Award (aka R15) is to expose undergraduate and graduate students to hands-on research. Dr. Beamer's title is Understanding how activation of the aryl hydrocarbon receptor (AhR) regulates IL-22 production in type 3 innate lymphoid cells (ILC3s). Millions of individuals worldwide are afflicted with immune mediated disorders affecting the lungs, resulting in difficulty breathing. Innate lymphoid cells (ILCs) have emerged as an important cell population that play an important, yet complex role in immune mediated disorders of the lung. The aryl hydrocarbon receptor (AhR) signaling pathway stimulates type 3 ILCs to produce either IL-17, which promotes inflammation, or interleukin 22 (IL-22), which suppresses inflammation and supports tissue repair in the lungs. However, the molecular events that trigger this response downstream of the AhR in ILCs remain unclear. The scientific premise of this work is that select AhR ligands may provide a means to therapeutically manipulate IL-22 expression by type 3 ILCs and not only suppress inflammation, but also promote tissue repairs. Establishing and characterizing how the AhR signaling pathway alters the functionality of ILCs may lead to the development of new tools for the treatment of inflammatory lung diseases such as asthma. With the help of undergraduate student researchers, we will answer this question using an array of in vitro and in vivo experimental approaches.